Making an album with eleven guest vocalists is one thing, but playing it live with all those musicians is an even bigger challenge. Job Roggeveen, master mind behind Happy Camper, managed to make such an album although it took him a few years to complete his project. It resulted in an album with beautiful tracks. But what he thought was close to impossible happened anyway: he gathered the busy vocalists on stage to play all those nice songs live. Case Mayfield is the one that has to warm up the crowd. The theater is full of friends, fellow musicians and Happy Camper fans. 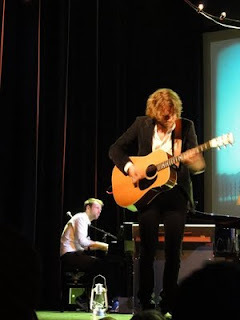 But Case is doing a great job with his modest appearance and nice intimate songs. Then it's time for the happy campers to take the stage. Roggeveen sits down behind his organ and the camping trip takes off. At the back of the stage an illustration of a camping site is hanging. 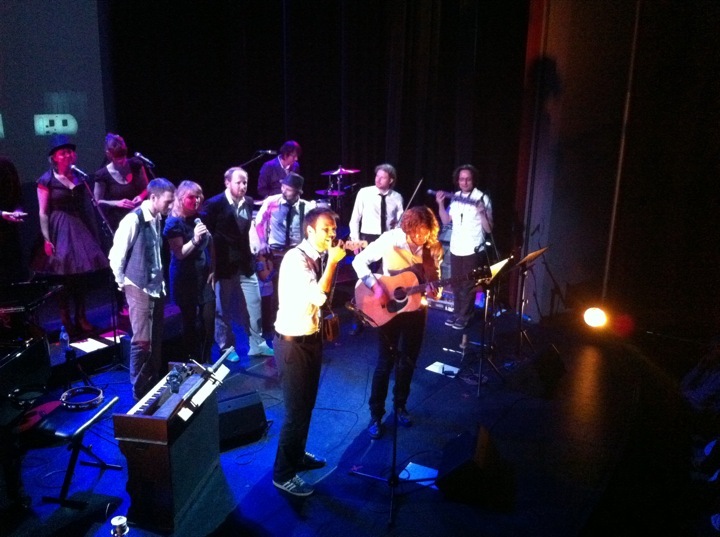 The backing band are most of his El Pino & The Volunteers colleagues. One by one the vocalists take their turn in singing their songs from the album. After each song they announce the next singer. What follows is one big happy musical trip through Happy Camper land. Leine, Tim Knol, Janne Schra, Ricky Koole, Blaudzun all await their turn in the spot light. The mood is hight and everyone is enjoying it a lot. Even technical problems for El Pino & The Volunteers frontman David Pino in the shape of a refusing "little blue box" that fails to amplify his guitar can't change that. 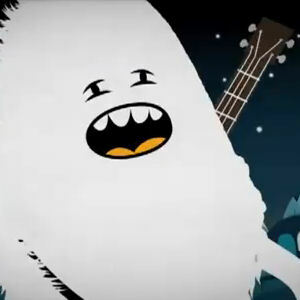 Of course Roggeveen's own animated yeti Manfred is making his appearance as well. The illustration comes to life and the friendly yeti starts in a funny but at the same time sad animation while Roggeveen backs him up on the organ. At the end of the show all performers gather once more for the big finale. It's an impressive achievement by Roggeveen to compose these great songs and to perform them live with all musicians. It also shows how many talented musicians we have in this small country. To see so many of them in one show is almost too good to be true and a real treat to the eyes and ears of any music lover. 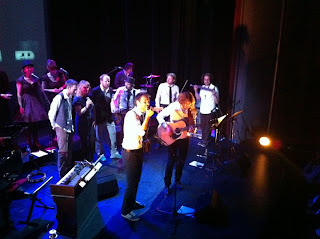 The pictures of this live performance originally appeared in this review on mousique.wordpress.com.